Bear Archery Legion with ready to hunt package. Bear Legion would be an excellent choice for someone seeking a compact, high quality and fast rig. 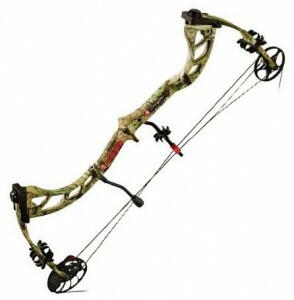 The surprisingly low price tag has made this bow very popular among advanced users who are on the budget but don’t want to compromise on performance. It has been highly praised by users that shot it in variety of situations. Legion is proven to perform well both in the hunting scenarios and while you practice target shooting. Bear’s quality noise and vibration reduction mechanisms have made this bow virtually silent and eliminated any hank shock. Over 60 years of experience enabled Bear to produce a bow that impresses even the pros with it smoothness and reliability. At the same time Bear Legion is so forgiving and easy to adjust that even beginners can use it. This compound scores high in customer reviews for its performance, smoothness and lack of after shot vibrations. The weak point according to some users and their personal preference is the string which is by no means inferior quality. Legion’s riser has a classic for Bear archery bows shape with large cutouts. It features integrated dual string suppressors and a stainless steel stabilizer mounting. The aircraft grade aluminum riser despite its low weight stands out in terms of rigidity resulting in high torsional stability. 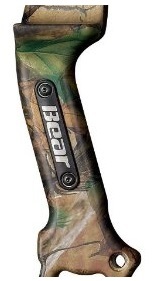 Bear Legion comes with thin grip with side plates known from other Bear’s rigs. It has ergonomic shape and enforces proper hand placement. Most users appreciate the stability and lack of torque it offers, however its ascetic construction offers no thermal insulation hence if you’re planning to use in the winter gloves will be necessary. The grip has a screwed in plates with white Bear logo on a black background. Bear Legion comes with split limbs positioned parallelly to nullify hand kick. They are made of extensible composite materials which makes them powerful, lightweight and durable. The shape and materials of Legions pre-loaded limbs enable uniform force distribution during the draw cycle and eliminates deflection. Legion’s limbs are locked in place by Bear’s renowned Zero Tolerance Limb Pockets. This system not only provide ideal consistency and precision but also absorbs after shot vibrations. Legion is a single cam bow and thus requires minimal maintenance and eliminates the necessity of cam synchronization. 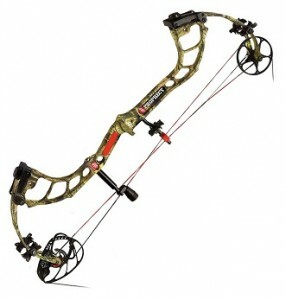 Bear Archery equipped it with a Modular E2-Cam. It allows for half inch increments in the rage of 26″ to 31″. The adjustment can be done with hex key (not included in the package) and a bow press is not required to do so. The idler wheel has a dual stainless steel sealed bearings which increase smoothness of operation and provide reliability. E2-Cam eccentrics provide generous 318 fps IBO speeds and thanks to their shape the draw cycle is smooth. This combined with 80% let-off and a solid back wall makes the bow very comfortable in use. 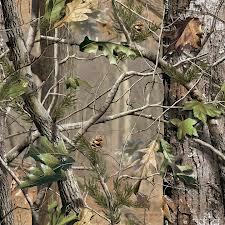 Legion comes in a light and neutrally toned Realtree APG camo pattern. The coating is high quality and quite thick which ensures durability. Dual offset string suppressors mounted on the riser deaden string oscillations and eliminate noise. They were designed, optimized and meticulously tested using high-speed photography methods to ensure highest effectiveness in noise reduction with no compromise on the arrow speed. There is also an adjustment mechanism so you can tuned is according to your preferences. The after shoot limb vibration and hand kick were eliminated by application of parallel positioned limbs and Zero Tolerance Two-Piece pockets. If you buy Legion with Ready To Hunt Package you will also get a Shockstop stabilizer by Trophy Ridge that efficiently absorbs any residual vibrations. 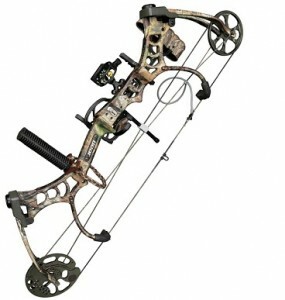 PSE Prophecy gained its popularity by being the fastest single-cam compound bow on the market. 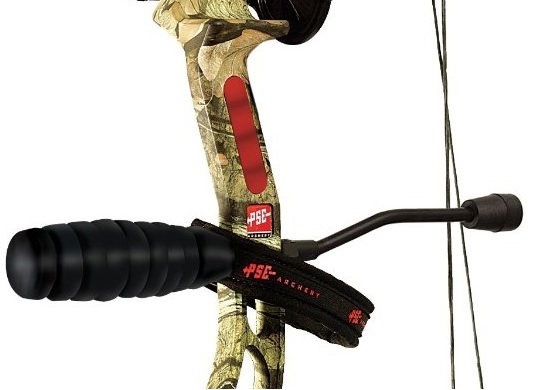 This rig offers unparalleled smooth draw for a bow that produces 340 fps IBO speed. It’s definitely a great choice for those who are looking for a fast compound bow but also appreciate the reliability of simple designs. 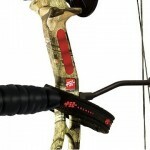 The neutral 32″ AtA length makes this bow universal. This bow has been reviewed by both advanced users as well as people with very little experience and both groups found it extraordinary. 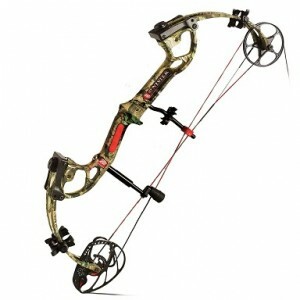 For our review of PSE Prophecy see the article below, specifications of the bow are at the bottom of the page. 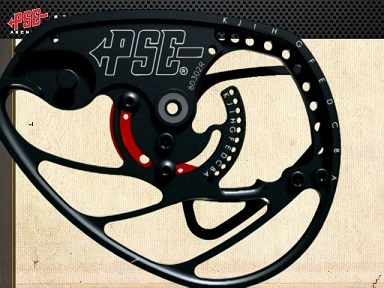 PSE Prophecy comes with a riser technology reserved for high end models. 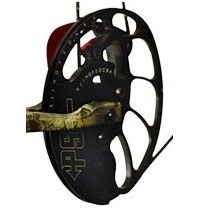 The planar flex riser reduces both sideways as well as front to back torque increasing the accuracy of the bow. It was achieved by application not only high tech materials but also a specific architecture based on straight lines. This structural changes were introduced in order to maximize the precision of this rig. It is difficult to spot with a naked eye but the effect of this changes is appreciated by anyone who shot this bow – the accuracy is nothing but amazing. Depending on your preference you will be able to mount your preferred sight with no problems as the riser of this bow is equipped with several holes for your convenience. Another feature of the riser aimed at increasing accuracy is the Raptor grip that forces proper hand hand placement. It’s thinner than average grip but comfortable in use. Both sides of the grip include small rubber plates that can be either black or red. The AMP cam enables the bow to shoot at 340 fps, which is impressive for a single cam rig. As all PSE cams it provide an extremely smooth draw and thanks to its unique design enforces a perfect nock travel. It it extremely durable and lightweight. For additional efficiency the cam was equipped with sealed bearings and wide grooves preventing the string from derailing. The inner cam is easily adjustable (range: 25-30 inches, increments: half-inch). You wont need a bow press or any special equipment for the adjustment. The cam has engraved markings and posi-lock pin to make it even easier if needed. The PSE’s new, ground-breaking X-Technology enabled to cross the barrier of 330 fts with single-cam rig. These split limbs sit tight in pivoting limb pockets enabling easy draw weight adjustment whilst keeping the perfect limb to riser adjustment. 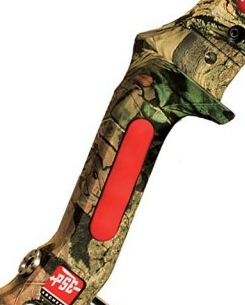 The limbs are pre-stressed and parallel to each other which eliminate limb vibrations and after-shot kick. 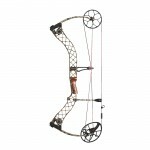 As all bows by PSE this model features high standard of finish. There are no issues with longevity or uneven wear. PSE Prophecy comes in four different versions: Mossy Oak Break-Up Infinity, Skullworks, Black Camo and Black. As with all PSE bows the materials are of highest quality which makes them durable and elegant. To minimize vibration and noise the split limbs sit tight in Brute X pivoting limb pockets. Limb vibrations are also dampened by Vibracheck limb band dampeners that are included in the package and can be changed without a need of a bowpress. The string oscillation is captured by adjustable Vibracheck Backstop 2 to eliminate noise. finish Mossy Oak Break-Up Infinity, Skullworks, Black Camo and Black.